Our "Favourite Videos" show you "mini-hago" groups around the world! Free music, hints & tips and articles. 150 pages of ensemble technique, free music and singularly bad musical definitions. If you live near Havant & Portsmouth and have 1+ years' experience, this informal adult guitar ensemble is for you! Corda Music Publications - home to over 50 arrangements by our MD Derek Hasted. Lathkill Music Publishers - home to another 13 arrangements by Derek. 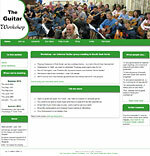 Lathkill music is also distributed by GuitarNotes. Les Productions d'Oz - a wide range of ensemble music including technically straightforward yet musically satisfying pieces. Derek has reviewed many in Classical Guitar Magazine. Consonance - A Russian based orchestra which is led by Lyubov Milovanova. Forrest Guitar Ensembles - a comprehensive list of Guitar Orchestras and Ensembles. Visit their survey! Gitarren Ensemble Graz - this Austrian based orchestra is led by Manfred Steflitsch. Jan-Olof Eriksson works at the School of Music, Pitea, Sweden. Jugendgitarrenorchester baden-württemberg is conducted by Helmut Oesterreich. Read their reviews! Guitarstrophe!, the Australian youth guitar orchestra is nothing less than stunning - check out their soundclips! Dr Hiroki Niibori has rationalised the guitar orchestra so we can enjoy the same camaraderie and rich sound as other music ensembles. The website has fascinating information as well as photographs of the largest guitar orchestras you'll ever see! NYGE, the National Youth Guitar Ensemble, featuring the finest of the UK's young guitarists. Read more on the EGTA website. Centocorde is an Italian guitar orchestra, whose website has a number of MP3s to listen to and some quite unexpected videos! The British Banjo Mandolin and Guitar Federation is a UK society that promotes ensemble work across a whole raft of fretted instruments. 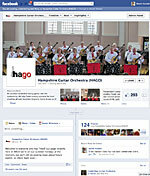 hago is happy to exchange links with other like-minded groups - just click here for information. If you find a link that has changed, please contact us with the new link so that we can keep this resource up to date.